Dentistry as a field has been making major strides—thanks to technology that allows for new techniques and increased understanding. However, things have not progressed as quickly when it comes to training new dentists. There is only so much that a student can learn about practical dentistry from reading books or listening to lectures. Hands-on education, which is more effective, is limited by resources (including people willing to volunteer their mouths for students to examine) and by the availability of instructors. Thankfully, that’s all changing because of groundbreaking efforts at the University of Utah School of Dentistry, where virtual reality is shaping the world of dental education in exciting new ways. 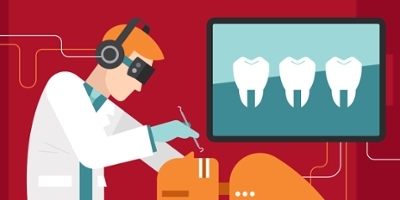 While the medical field has been using virtual reality education for a while now, it has not been applied to dentistry on a large scale. The tipping point in the virtual reality dental revolution came when the cost of a head-mounted display became ten times cheaper. A head-mounted display is a screen, typically placed in a visor, that allows a user to see information without having to change their viewpoint or turn their head. This, combined with a generous donation from the Oral and Maxillofacial Research Foundation, enabled the innovators at the University of Utah to get started. The primary benefit of virtual learning is that it is the next best thing to examining a real mouth in person. Instead of 2-D photos and text descriptions, students can get up close and personal with a wide variety of mouths so that they can get a sense of what to expect in the real world. Not only does this 3-D imagery enable faster learning but also it allows teachers to create endless scenarios to test student reactions. For example, a student may be examining a virtual patient when the patient has a heart attack. The student can learn to respond to the situation with immediate feedback from the instructor and repeat the scenario as needed. This is a marked contrast to traditional methods where students interacted with a dummy that did not provide the same level of realism. This technology is already being used in a five-week Dental Implant class, which is the world’s first full-length dental course using virtual reality. It is also used in a limited fashion in other classes, where students learn about topics that include fillings, crowns, extractions, and periodontic control.